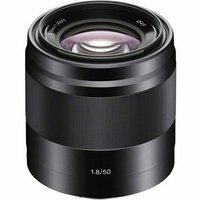 Stylish and lightweight, the Sony E50mm f1.8 OSS Lens is a fast prime lens with a large f1.8 aperture designed to perfectly complement Sony's E-mount APS-C compact system cameras. The bright f1.8 aperture with shallow depth of field allows you to capture the detail and create a smooth background bokeh effect. The built-in Optical SteadyShot (OSS) is ideal for taking atmospheric handheld portraits without flash in dim light. Direct manual focus disengages the AF motor for precise, fine manual focusing control. The Sony E50mm lens is ideal for portraits, travel, shooting handheld in low light and is a great way to push your creative boundaries.